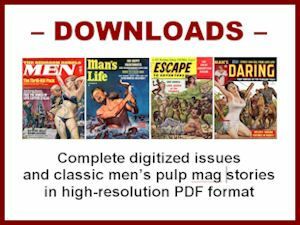 Men's Adventure Magazines: Why'd it have to be snakes, Indy? ‘Cause they’re frakkin’ scary! Why'd it have to be snakes, Indy? ‘Cause they’re frakkin’ scary! Remember that snake scene in the original Indiana Jones movie, Raiders of the Lost Ark (1981)? His native sidekick Sallah (John Rhys-Davies) has a great reply. Of course, that’s exactly why snakes were a popular subject in men’s adventure magazines. They’re always frakkin’ scary and dangerous! At least, in the men’s postwar pulp zone. 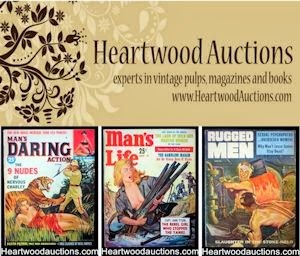 I have a number mags in my collection with snake cover paintings and stories that could provide the basis for some great Indiana Jones sequels. 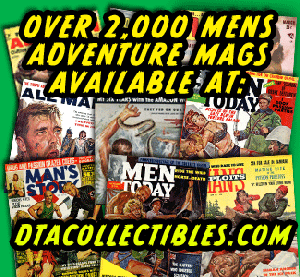 The March 1958 issue of Man’s Adventure at left is one I particularly like, even though it’s a bit tattered. 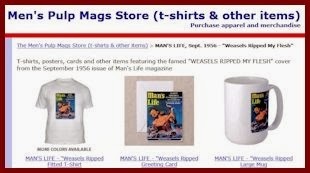 It has three classic men’s adventure magazine elements. In addition, it has some snakelicious interior artwork by the renowned comics and magazine artist Syd Shores (1913-1973), a.k.a. Sydney or Sid Shores. He probably painted the cover, too, but it’s uncredited in the magazine. Shores may be best known for his work on the “Golden Age” Captain America comics in the 1940s. But he continued to do much-admired penciling and inking for Marvel Comics through the 1960s, as well as many illustrations for men’s adventure mags. It’s an exotic jungle adventure tale set in New Guinea, with a corpse and Ophidian-filled pit. You can read this gonzo story for yourself in PDF format by clicking this link. 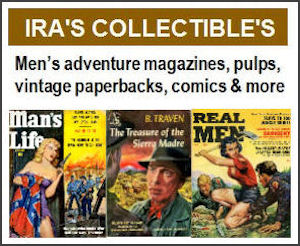 Labels: Captain America, Indiana Jones, Man’s Adventure, Marvel Comics, Men's adventure magazines, Men's pulp magazines, Men's sweat magazines, Raiders of the Lost Ark, Snake menace, Syd Shores, Why'd it have to be snakes?